Babies just born up to 5 months of age, our style is a little different than what you see on every other photographers page and Pinterest. 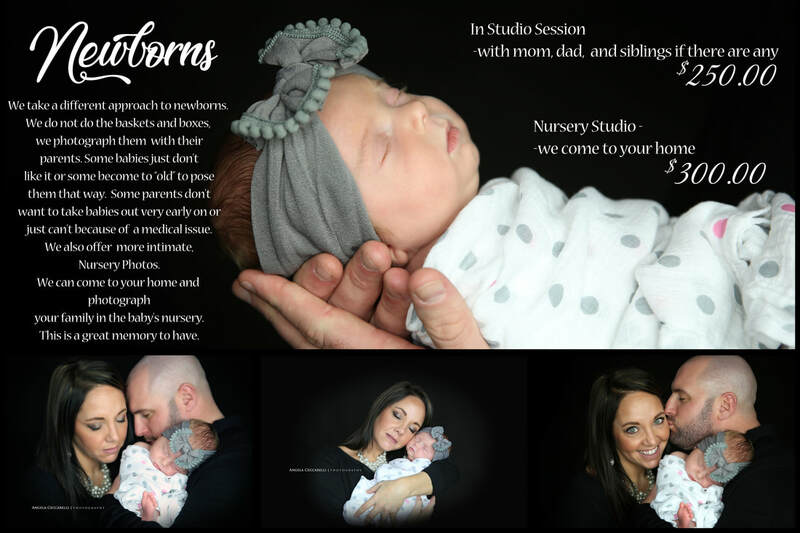 We do not follow the standard of the baby tightly wrapped and put into a basket or a bowl, we decided to do something different for the parents that want something different, we photograph the baby with parents, with parents and siblings, with grandma and grandpa or just their siblings alone. We do take a few photos of the baby alone, but for the most part, some part of the parent will be in the photos, even if is just your hands or your rings on their toes. Some babies may not be released from the hospital in time to pose in the baskets or may have a medical condition, so it is best the parent holds them in a photo. We shoot these photos on either all black with parents wearing black and the baby in a contrasting color, or in all white. It brings a dramatic, yet classic look to the photos. And for the moms that are weight conscience after just giving birth, no worries ~ the background being the same color of their outfit, they will blend into the background making that "baby weight" no big deal. We can also come to your home for Nursery photos. Many families create a sanctuary for their babies, what a great way to remember how much work you put into the perfect nursery with all the cute books and stuffed animals, the wall murals and furniture.